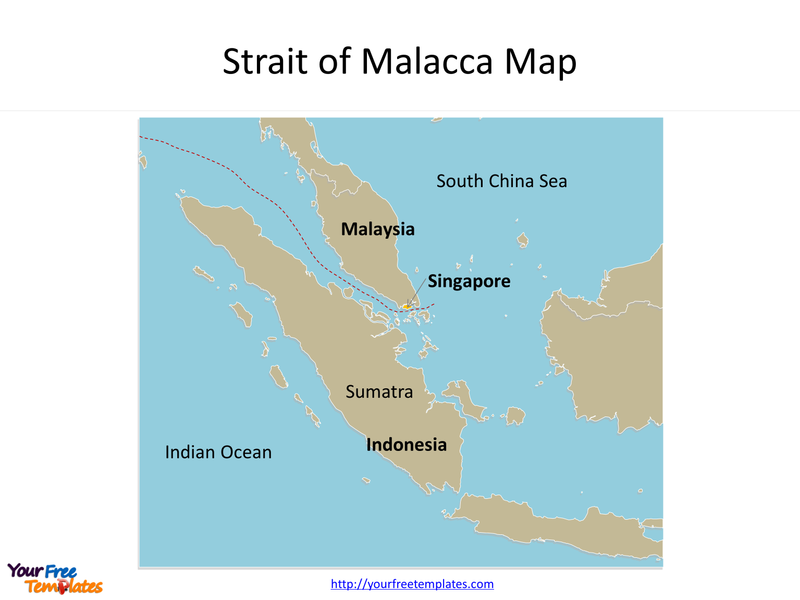 The Map of Strait of Malacca Template in PowerPoint format includes two slides. They are the blank Strait of Malacca map and Strait of Malacca outline map with cities. Firstly, our Strait of Malacca outline map free templates have major cities on it. They are Jakarta, Palembang, Medan, Padang, Bandung, Pontianak, Kuala Lumpur, George Town, Ipoh, Malacca and Singapore. Secondly, there are 3 Basin countries which forming Strait of Malacca map free templates, highlighting the three countries that are Malaysia, Indonesia and Singapore. 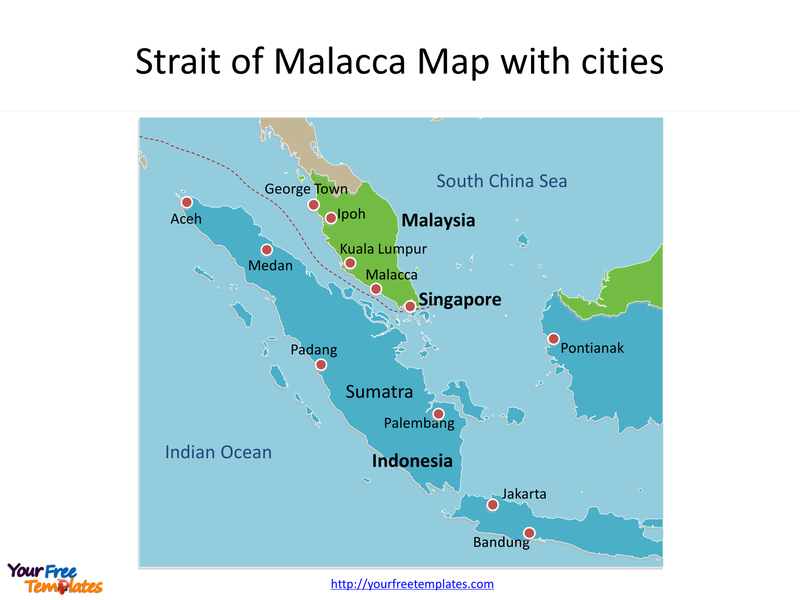 The Strait of Malacca Map free templates include two slides. Our Map of Strait of Malacca or Straits of Malacca is a narrow, 550 mi (890 km) stretch of water between the Malay Peninsula (Peninsular Malaysia) and the Indonesian island of Sumatra. From an economic and strategic perspective, the Strait of Malacca is one of the most important shipping lanes in the world. Firstly the strait is the main shipping channel between the Indian Ocean and the Pacific Ocean, linking major Asian economies such as India, Indonesia, Malaysia, Singapore, China, Japan, Taiwan, and South Korea. Secondly About a quarter of all oil carried by sea passes through the Strait, mainly from Persian Gulf suppliers to Asian markets. Finally it is also one of the world’s most congested shipping choke points. Because it narrows to only 2.8 km wide at the Phillips Channel (close to the south of Singapore). You can find relevant countries in our Strait of Malacca map free templates. The major cities in Strait of Malacca are including Jakarta, Palembang, Medan, Padang, Bandung, Pontianak, Kuala Lumpur, George Town, Ipoh, Malacca and Singapore. What is more, every individual political subdivision is an editable shape. The labels and shapes are different layers. In a word, you can change the texts, colors, sizes, highlight some map shapes, and add your charts. At the same time you can also refer to the fully labeled Map of Strait of Malacca in Wikipedia. The most important of all, analysts from marketing research companies, consultants from professional firms think highly of our website yourfreetemplates.com. Because our maps can help them reduce their efforts and create attractive maps.